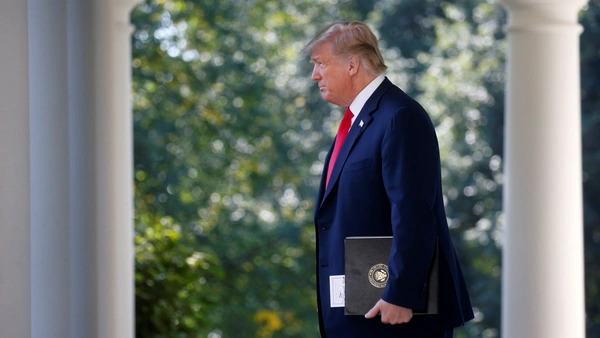 U.S. President Donald Trump arrives to deliver remarks on the United States-Mexico-Canada Agreement (USMCA) at a news conference in the Rose Garden of the White House in Washington, U.S., October 1, 2018. Leah Millis/Reuters. No, the renegotiated North American Free Trade Agreement (NAFTA) announced Monday is not, as President Trump predictably called it, “the most important trade deal we’ve ever made by far.” Not even close. The Trans-Pacific Partnership agreement with 11 Pacific Rim countries, which Trump walked away from on his first week in office, would have been far more significant for the U.S. economy. The Uruguay Round agreement that created the World Trade Organization in 1995, and China’s subsequent entry into the WTO in 2001, for that matter, were vastly more important. The new NAFTA’s economic impacts are likely to be minor in comparison because of the already deep cross-border trade ties in North America. But the hyperbole should not detract from the president’s accomplishment. He has succeeded in refashioning the agreement, ironically, in ways that have long been demanded by many Democrats and those on the labor left. Robert Lighthizer, the U.S. Trade Representative who negotiated the deal, has said, to much skepticism, that he wants to refashion U.S. trade policy to “return to the days where there was a substantial majority of people in both parties that voted for these trade agreements.” Despite the confrontational and sometimes ugly way in which it was achieved – with tariffs and the threat of more against Canada and Mexico – the new NAFTA could be an important step in that direction. What Biemiller was foreshadowing, of course, was what third party presidential candidate Ross Perot would call in 1992 “the giant sucking sound” of U.S. jobs moving to Mexico chasing lower wages. And it was no illusion. Trade economist Richard Baldwin has identified a big shift in the early 1990s, what he calls “the second unbundling,” which came from the combination of mobile capital and modern information technology. Whereas companies once could not easily manage their best technologies in developing-country factories, today the biggest companies have global supply chains and can move production to wherever it can be done most efficiently for the company’s bottom line. The car companies, for example, can marry the best U.S. technologies with the lower-cost Mexican labor force, an unbeatable combination. Organized labor has tried for half a century to fight back. In 1971 the unions tried and failed to push through the Burke-Hartke bill, which would have slapped tariffs on a wide range of imports and pushed up tax rates on overseas investments by U.S. companies. The legislation went down in a hail of lobbying by U.S. multinational companies. As a fallback, labor began pushing the idea of requiring that U.S. trading partners adhere to higher labor standards, a back-door effort to push up wages and costs in developing countries, hopefully mitigating the negative impacts on U.S. workers. NAFTA was the first trade agreement to adopt this provision, when incoming Democratic president Bill Clinton insisted on adding a labor rights side accord to the deal. Such provisions have been a staple of subsequent U.S. trade deals, but they have done little or nothing to address the problem. Fueled by NAFTA preferences, Mexico is now the world’s fourth-largest exporter and seventh-largest producer of cars. Yet the wage gap – the difference between what Mexican workers earn and what American workers earn – has actually increased since NAFTA was signed, leaving U.S. auto workers in an even deeper hole. The new Trump NAFTA—renamed the U.S.-Mexico-Canada Agreement (USMCA) – is unlikely to reverse these huge economic and technological forces. But it does some of what labor and the Democrats long wanted: It pushes back. The new “rules of origin” on cars, for example, will require that a significant portion of the content in any vehicle sold tariff-free in North America comes from facilities where workers make at least $16 an hour, far above Mexican wage rates. That could bring some auto sector work back from Mexico to the U.S. or Canada. The agreement also promises long overdue strengthening of Mexican labor laws, which could finally permit independent union organizing in the export-oriented plants. And it weakens or eliminates so-called investor-state dispute settlement (ISDS) provisions, which have long been criticized by organized labor. The unions argue that ISDS—which allows companies to sue governments directly over actions that harm foreign investments—have been used to challenge consumer safety, environmental and workplace protections that should be the prerogative of sovereign governments. And ISDS further encourages outsourcing of jobs by providing additional legal protections for companies in developing countries where legal processes may be weak or corrupt. The unions have opposed every major trade deal for the last 40 years, except the 2000 agreement with tiny Jordan that set a new benchmark on labor standards, and most Democrats have followed their lead. That may not change anytime soon, but with the new NAFTA, President Trump has done more to address their concerns than any Democratic president ever achieved.